I've noted problems I've had with this model, and some solutions or work-arounds, in case the information may help others. Of course there's no guarantee that you will have the same cause of failure for particular symptoms, it's just a possibility. Please don't email me with questions about other faults, maintenance, etc.. I'm not a mechanic, my specialist knowledge is on this page. For anything else I have to look in the user manuals, search the internet or consult a garage. I don't guarantee that the information given is fully correct, or that you or your car may not be harmed if you try any of the procedures! Modern European cars have an "On Board Diagnostics" (OBD) system. Various OBD readers are available which display stored fault codes known as Diagnostic Trouble Codes (DTCs), and some also give a description DTC which is very useful. One type of reader has a handset, others consist of a connecting cable which plugs into a computer running a dedicated software program. There are different types of readers depending on the interface type of the car (e.g. CANBUS), so it's necessary to check which model is suitable. With engine cover / air box removed - click for larger image. The air box has four press fit connectors.To remove it I pulled off one pipe on the right underside, then pulled up each corner in turn. To replace, I pressed corners to engage connectors, and put pipe back - when I remembered! Other models and dates may have different piping and fixings. This has happened 100s of times over 12+ years, sometimes when encountering some air pollution or changing gear (OBD DTC P0501, Vehicle Speed Sensor Range/Performance, often reported). The EPC lamp comes on with the exhaust emission warning lamp (engine symbol), then the latter lamp remains lit for several start/stop cycles. My solution is now to ignore it if the warning light goes off by itself after a couple of days, and there are no other symptoms like loss of power or strange noises. Obviously there are many reasons why these warning lights come on, and some may indicate a serious fault. After cleaning inside the throttle control valve body on my car engine (item 7), these warning lamps came on less frequently. The exhaust emission warning lamp is coming on more frequently. I suspect that some of the problems are due to carbon based build up on sensors and actuators in the inlet manifold system. The owner's manual (book 3.1 page 19) says the Lambda Probe (Oxygen sensor) could be faulty - two are fitted to this car model. Or I guess it could be the MAP sensor, Exhaust Gas Recirculation (EGR) valve etc.. This engine design, along with others of recent build, diverts exhaust gas into the inlet system with no filtering, thus eventually causing problems. Although this design is supposed to produce less emissions, did anyone take into account the environmental impact of millions of vehicles failing, new parts being manufactured, trips to garages, not to mention the cost and inconvenience to unfortunate car owners? See also: Section 16 - after changing the pre-catalyst Oxygen (Lambda) Sensor these warning lamps are coming on less frequently, about every 100 miles for a short time - that's progress believe it or not! This happened suddenly a few miles from home, but I managed to return on 2 cylinders (if one fails to fire, the next but one in firing order is disabled - to reduce vibration). In this engine there is a separate HT coil for each cylinder, mounted on the spark plug. The OBD DTCs P0301-P0304 should indicate which cylinder(s) are misfiring, but these DTC's might not be present. There are many reasons why the cylinder would misfire, since the Engine Control Unit manages ignition, but spark plugs and coils are easy to check without specialist equipment. Assuming a coil fault (this is VERY likely), if an OBD reader is available and reports one of the DTCs P0301-P0304 (cylinders 1-4), then that specifies which cylinder to try substituting a new coil. Another method is to substitute a new coil on each cylinder in turn until the problem goes away. 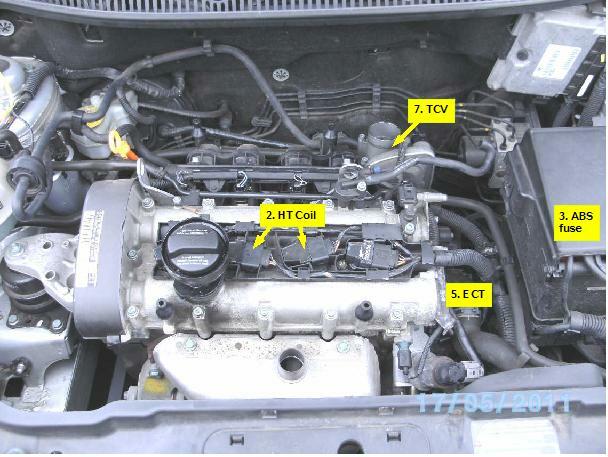 The HT coils are accessable on the top of the engine, but can be tricky to remove. First undo the cable tie clips - a flat screwdriver should help. To get a grip on the coils putting a loop of string or a strap around it may be useful, or using an L shaped piece of metal may also work. A flat bladed screwdriver is useful for releasing the lock on the underside of the connector. You have to remove the oil filler (unscrews) for coils 1 and 2, but it must be replaced before starting the engine. The replacement coils I bought had solid collars which did not fit in the existing locating frame - my simple solution was to trim the collars so that the coils could be pressed home. The HT coils cost from about £20 each for a non original VW part. It seems that the HT coils which VW and other manufacturers (e.g. Renault) used in the early 2000s have had a lot of failures. This is a 2003 article from the New York Times on VW/Audi faulty coils. I heard that some owners replace the complete set (including me eventually), but they may fail also - see below. Several years later the same thing happened, bad misfire and serious power loss (engine warning lamp was flashing). The DTC code P0303 was reported, and the fault disappeared when I changed the ignition coil for cylinder 3. Subsequently I cleared the DTC with an OBD tool. This was a replacement coil which had only done about 20,000 miles, kept original for spare. I always carry a spare ignition coil in the car, and a piece of strong wire to assist with removal, in case (or when) the fault occurs some distance from home. Coil failed on same cylinder (it was an original one). Checked spark plug was OK, fitted my last (original) one. Ordered a Bosch coil @ £28 hoping it may be a more reliable type if (when) fitted. The last original coil failed, so thats 4 + 1 replacement failures in total. Bosch part fitted, and another spare ordered without delay! The ABS warning light came on (brakes operated normally but without the ABS function). A helpful person diagnosed a blown ABS module fuse. This is located on the battery cover and costs £1 - £2. The usual advice is to find out what caused the fuse to blow, but in this case it seems to have been "metal fatigue" of the fuse metal strip rather than a circuit fault. Another cause of the ABS light showing was a faulty connection in the wiring to a wheel rotation sensor. Solution was to clean the connector contacts (near wheel hub), then the light went off after moving the car a few yards. Serious misting up in winter - the air recirculation control was stuck on recirculate. I manually moved the valve to "fresh air" position - the actuator lever is under the glove compartment. A fuse might have blown, but not in this case. The actuator motor assembly looks to be exceedingly difficult to change. Therefore I no longer have air recirculation facility. With a warm/hot engine the car failed to start, appearing to be due to fuel flooding - started if throttle held partly open. It appears that the sensor was reporting a cooler than actual coolant temperature, resulting in a rich mixture being set by Engine Control Unit (ECU ). A low reading also was seen on the dashboard temperature dial. The ECT's are available from about £12 (getting a new O-ring and clip advisable). One has to be careful to get the right one - they vary with engine type and there are other temperature sensors fitted. 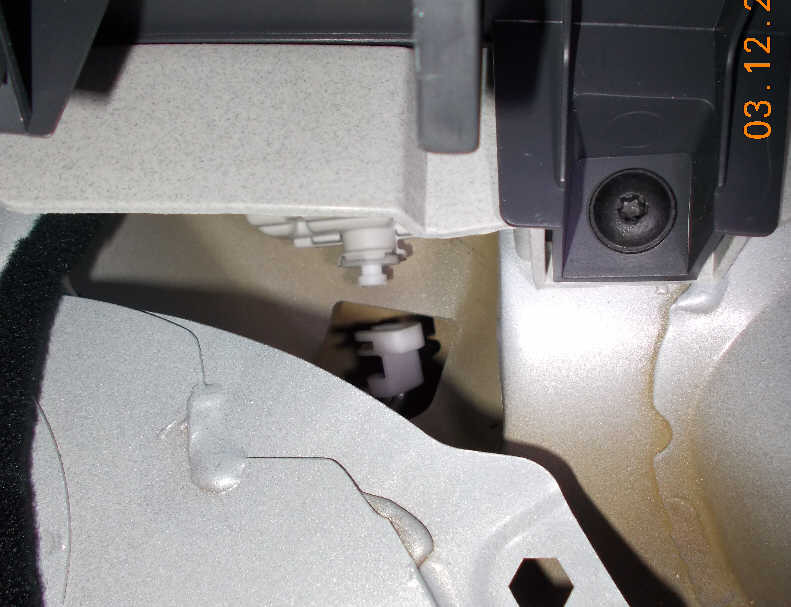 The ECT sensor is located on the right hand side of engine on a water coolant housing (out of sight on photo above). It is possible that a faulty ECT sensor may cause other problems, including incorrect fuel mixture causing engine starting difficulty. 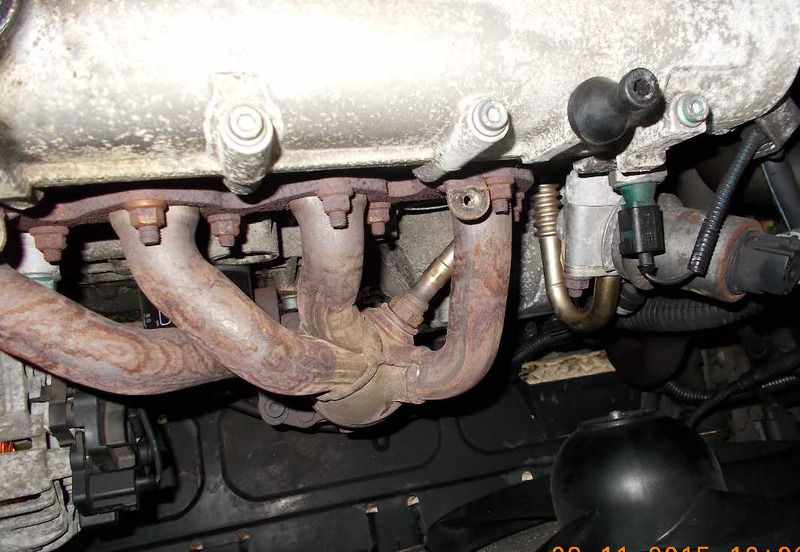 Noises from suspension have many varied sources, but if you find that the anti-roll bar (or torsion bar) is loose in it's chassis mounting bushes you may have found a common fault on models of this age. A hard plastic sleeve is fitted on the ARB between it and the rubber mounting bush - these can break and fall away leaving the ARB to move and bump into other parts. The photo below shows the original arrangement (from same model, not my car). P0501 Veh Speed sensor : range performance. On doing some research it appears this is a common fault on many car types, garages quoted typically £50 to more or less just get the DTCs (I knew those already) and check hoses etc. (I did that). The fault could be many things, but I suggest being cautious about changing things like EGR assemblies and sensors - as the bill would rapidly go to many 100s of pounds. I thought the throttle control valve (TCV) air duct might be clogged or sticking due to deposits, although it looked fairly clean from the outside. 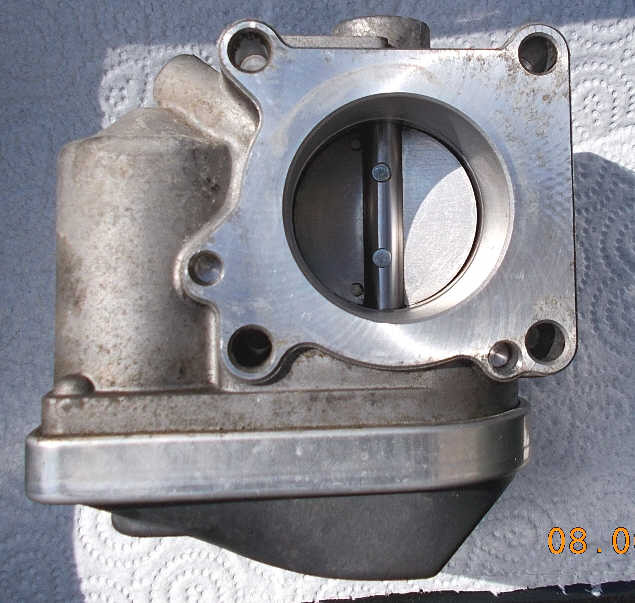 The butterfly valve is closed when the engine is idling or stopped, so it's not possible to see beyond it. I didn't try to move the valve by hand as this could damage the actuator mechanism (expensive). 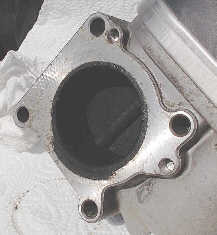 I took the throttle control assembly off the manifold flange (4 bolts, metal gasket), and there were hard deposits coating the duct below the valve, and on the valve underside. This would practically shut off air flow at idle position and maybe cause the valve to stick. Having removed the deposits with carb. cleaner the fault has gone away - so total repair cost about £2 for cleaning fluid & kitchen paper roll! NB I understand caution is advisable when working on the throttle body - disturbance can change the engine characteristics. On modern cars adjustments can only be made electronically (i.e. by suitably equipped garages), but on this model it seems the ECU (engine control unit) automatically adjusts the idle speed to a preset value after a period of running. On my car the idle speed rose to 900 rpm for a while - then reverted to the more usual 700 rpm after a couple of hours running. After cleaning, the idle speed MAP reading rose to about 10 ins Hg - presumably this higher pressure in the manifold is due to the air inlet valve no longer being almost blocked. Also, the ignition timing became steady between -11.5 and -12.5 degrees. Amongst other things, the MAP sensor (including inlet air temperature (IAT) sensor) could also have deposits. 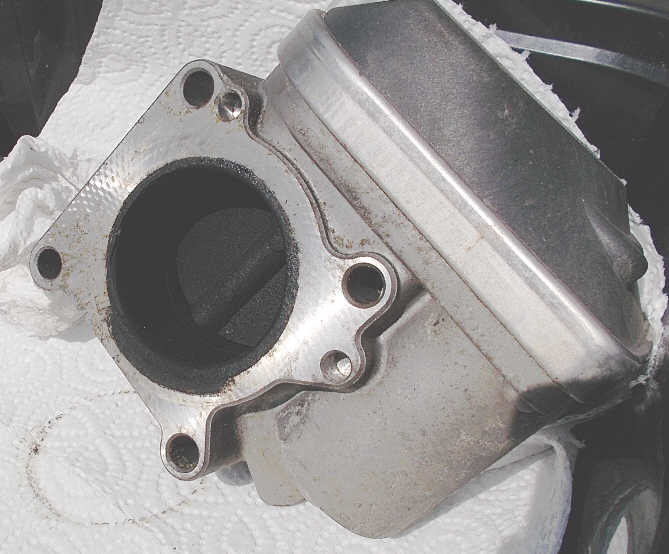 The sensor is located on the left side of the inlet manifold, and requires careful handling if inspection is attempted. The EGR valve itself , and turbo charger (if fitted) could also suffer. After cleaning inside the throttle control valve body, the EPC and exhaust emission warning lamps came on less frequently. It struck me that it wasn't a brilliant design to let "dirty air" from the exhaust get into the inlet manifold without some form of filtering. Apparently exhaust gas recirculation (EGR) is required by law, but efficient, reliable technology didn't seem to be available in 2002 (or wasn't fitted) on this model, and many others I expect. Bad news for car owners and the environment, but for repair garages and parts manufacturers the deficient engine design could tend to increase their revenue I imagine. The engine idle speed was variable and too low (one of reasons for MOT failure). This is a symptom of the TCV requiring to be cleaned, and that was the case - see photos before cleaning, and after cleaning. However the rest of the inlet manifold and its sensors is still covered with sooty "gunge". 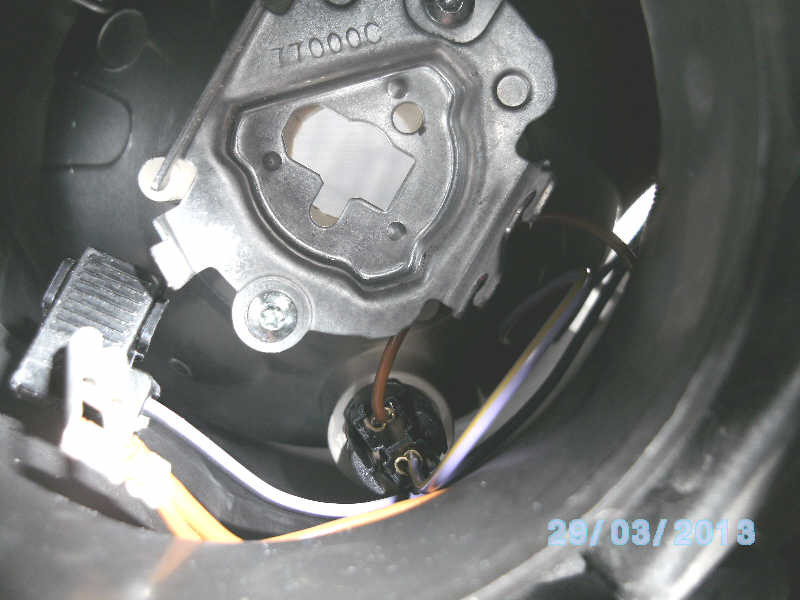 The familiar whirring noise stopped when locking or unlocking the car - soon realised that the fuel filler flap lock actuator wasn't working (stuck in locked position). 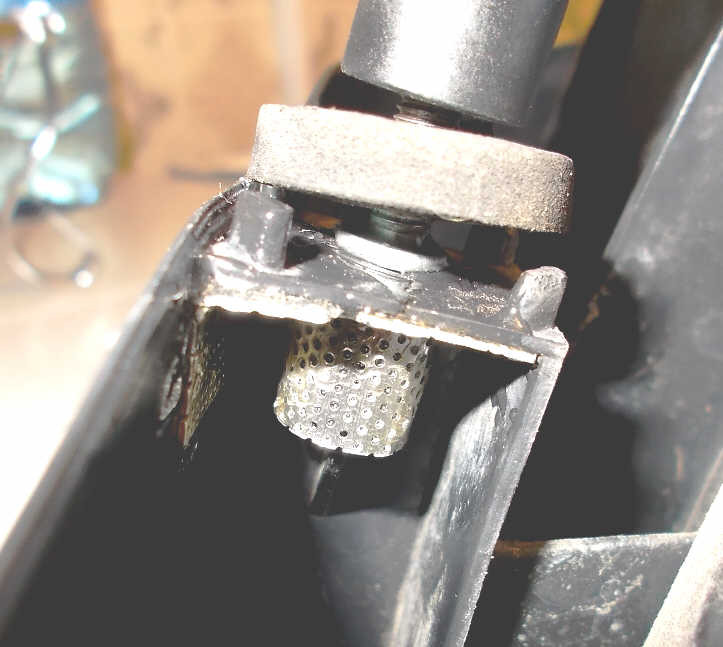 The cheap solution was to pull back the fabric from the inside of the car boot near the fuel filler - then the actuator and push rod can be seen at the back of the internal body panel. There is a push fit joint in the rod which can be disconnected (pliers may be useful), the rod can be pulled up - releasing the lock (photo). For security I purchased a locking (keyed) petrol cap for £9. Over time the lock rod may drop back into a locked position by itself, or if the actuator starts working again it may cause the lock rod to move into the locked position. Since the actuator works sometimes on my car, I made a low cost modification of jamming some tape around the locking rod, preventing the actuator from touching it. Occasionally the front electric windows don't work. Operating the security door locking (buttons inside drivers door) to locked, then unlocked, seems to fix this for me. It seems to be a feature of VWs that any door is difficult to shut if all other doors & windows are closed - due to air pressure build up. So I usually shut the tailgate with a door or window open to save "slamming" it. Even with the tailgate firmly shut I had a problem with the locking of the tailgate resulting in the associated warning light coming on intermittently. VW changed the tailgate lock under warranty and corrected a wiring loom manufacturing fault. Even with cars out of warranty I believe car makers are obliged to correct manufacturing/original component faults free of charge (but I don't know details). I expect squeaky suspension has many causes, this time it was the rear bushes of the front lower track control arm (also known as lower wisbone). These bushes don't look very strong in the first place. It was decided to change both front track control arms, including ball joints, rear and front bushes. While investigating part sources I noticed some sellers include the ball joints, others not, even though they are shown in parts description photographs (e.g. supplier GSF, 3/2013). The rear bushes have nearly disintegrated, mostly consisting of air they were useless. I've now fitted a heavy duty type from www.psbushings.com, which are made from solid polyurethane. After about 5000 miles these are working well, with less suspension rattling and hopefully longer tyre life with wheel geometry that isn't all over the place. VW state that bulb changes shouldn't be attempted by owners due to the risk of injury. 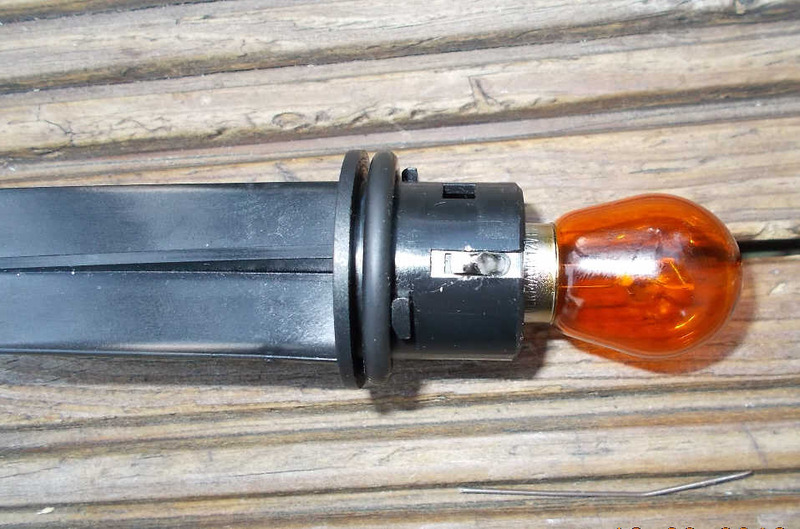 The side light bulb (5W W5W/501) and main (high) beam bulb (Halogen H1 55W) are in the same reflector unit, which can be accessed on this model without dismantling the vehicle. This is not an easy process especially on the battery side. I found it useful to have a mirror and torch available. To summarise for main beam: I pulled off the rubber cap, removed earth and power leads (push fit), and removed the retainer clip from the bulb which is a loose fit in holder. Fitting is the reverse order, taking care not to touch the bulb envelope glass. For the side light I first removed the main beam bulb (this may not be necessary if you have tiny, flexible fingers), then pulled the side light bulb holder out of its housing (it's a push fit). The bulb is a push fit in its holder. This photo shows the main beam bulb removed, with side light still in place. The retainer clip for the main beam bulb is right of centre. I've added a note to remind myself how to do this (only second time in 15 years). It's a lot easier than changing side or main beam bulbs, but only if I remember how! First remove rubber cap, then remove wire connector (just a push/pull fit). Rotate the black plastic bulb holder slightly - it can move a few degrees on 2 locating screws. This is when a mirror and torch would be helpful to see which way to turn the holder. It may be worth unscrewing screws slightly if holder is stiff to move, but I didn't do this. The bulb can now be removed, noting orientation. Fitting is the reverse order, taking care not to touch the bulb envelope glass. Usually the engine starts first time but it was getting hesitant, needing 2 or 3 attempts. This was remedied when the spark plugs were changed, something simple for once! 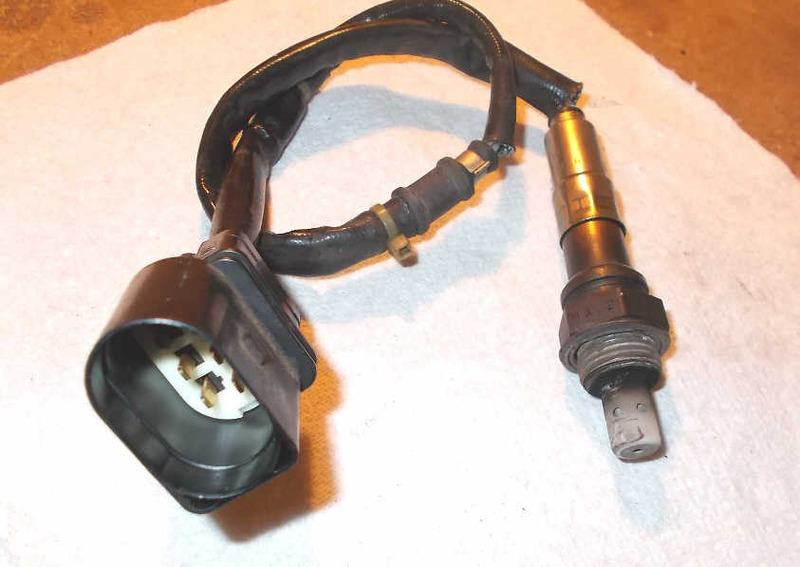 Removing the ignition coils which sit on the plugs can be tricky, see section 2 above. A knocking noise turned out to be a worn lower ball joint of the drop link to the anti-roll (torsion) bar on the driver's side. It was difficult to locate the knocking noise source because the sound is distributed via the anti-roll bar. This is the second failure - first at about 30,000 miles, now at about 50,000. I don't do much mileage, but over a lot of speed bumps and poor surfaces. The link costs about £15, and should be easy to fit - however mine had to be cut/ground off the anti-roll bar. Update: At 59,000 miles I needed the 3rd (yes third!) replacement drop link on driver's side. The exhaust emission warning light (engine symbol) was on almost continuously, except for a few minutes now and again. Using an OBD II reader, DTC P1178 was seen (Linear O2 sensor/Pump current open circuit, VAG code 17586), and sometimes related DTCs P1180 or P1190. These DTCs relate to one of the Lambda or oxygen (O2) sensors. There is a "pre" catalyst O2 sensor fitted on the manifold (houses first cat. 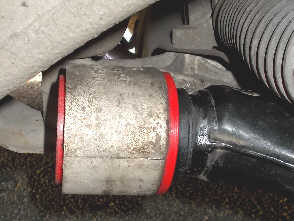 convertor), and a second ("post") O2 sensor fitted after the second cat. convertor under the car. These sensors provide information to control the engine mixture. The engine seemed to be working OK, but there was some engine "knocking" or "pinking" sometimes. I decided to fit a new pre-catalyst Lambda sensor, and on this model a 5 wire type is fitted. A loud and worrying screeching noise came from a front wheel as I drove away from home. I took the wheel off and it seemed as though a small stone had wedged between the disc and the back plate. It had dislodged itself when I moved the car, but I could see scratch marks on the plate. I think I've had this before, and even a trapped crisp packet has given some cause for concern, since the noise seems to be amplified through the metal parts. I suppose this might happen on any car with disc brakes. The heater fan wouldn't work in position "1" - the ballast resistor had failed in that position. 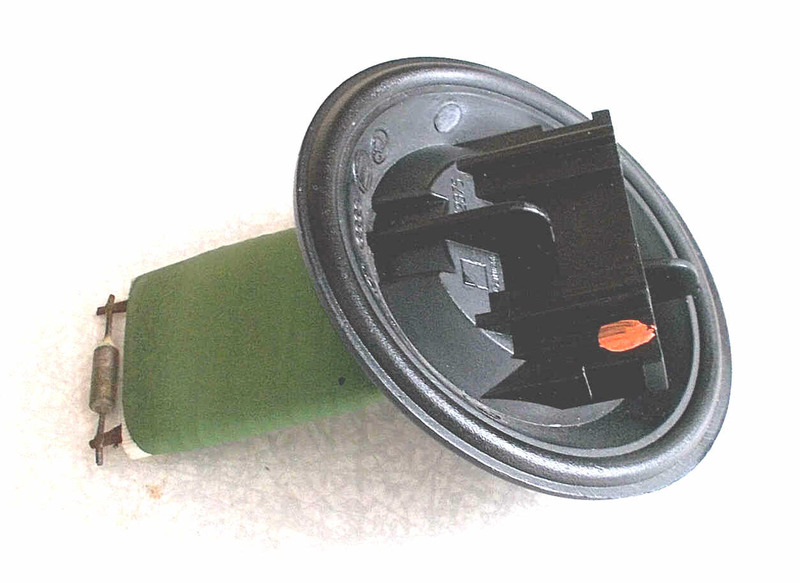 There are 3 of these resistors in an assembly (photo), inserted into the heater casing behind the glove box. 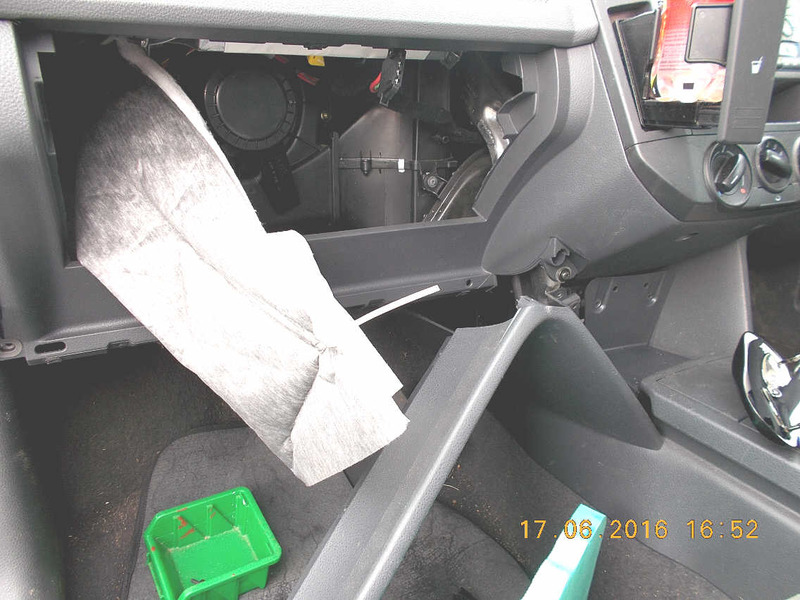 To change, the glove box must be removed, but it's not necessary to remove the heater - that would be a very big job. The resistors should measure approximately 0.2, 0.5 and 1.5 ohms relative to pin 1 on the assembly. A new assembly varies in price from about £5 to £40 plus. There are a couple of useful videos on You Tube on this subject (search for "change heater fan resistors on Polo 9N" or similar), so I won't repeat the method described. I did not remove the side of the central console completely (see photo). I removed and refitted the resistor assembly while the connecting wires were still in place, but removed tie clips from the wiring loom while doing the work. The EPC lamp was on continuously, and I noticed that the brake lights were not working, pointing to a faulty brake pedal switch. This is one of the many faults which could cause the EPC system to malfunction. Having checked the fuse, I changed the switch (part cost £9.50), and the brake lights work now. The EPC lamp cleared itself after about 10 start-stop operations. The switch is easy to change. It's necessary to remove the panel under the steering wheel, but I was saved the trouble because a garage failed to replace it sometime in the past. Of course, the switch may fail so that the brake lights are on when they shouldn't be, possibly causing unusual engine behaviour and/or lighting the EPC warning light. This is a link to an explanation of the mysterious EPC system. I don't know how accurate the article is, but it seems to be almost a miracle if the system works reliably! As far as I've seen the owner's and Haynes manuals don't explain anything about EPC, even what the acronym stands for. With no warning the engine wouldn't start or turn. The battery was OK, dashboard lights on, and fuel pump working. Since there was no click the starter solenoid seemed suspect. 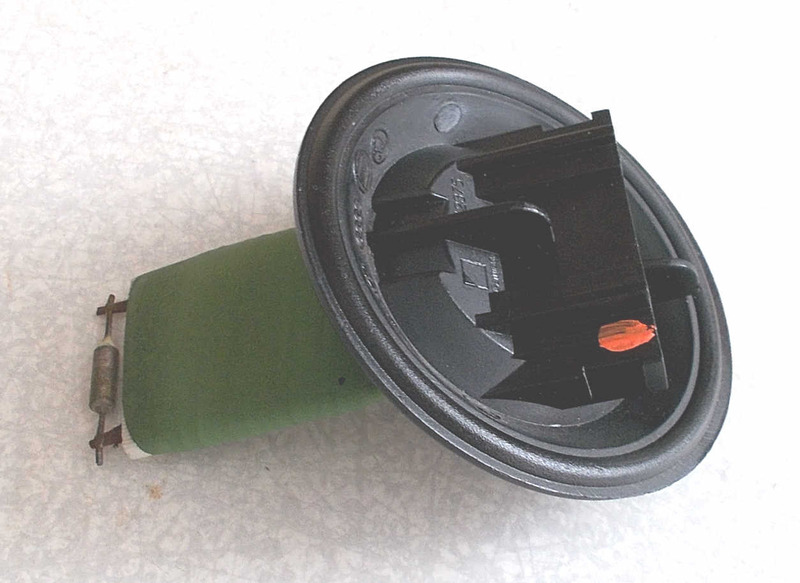 On inspection, the control wire for the solenoid had broken inside the connector which fits onto the solenoid. It's a mystery why this happened, since it's a fairly thick wire. Many other wires around the engine are thin, which makes me a little worried. I was able to solder an additional piece of wire in place as a repair, with heat shrink sleeving and silicone sealant to support and protect it. I was in the process of testing whether 12V was present at the solenoid control wire when the ignition switch was in the start position. This would have shown whether the solenoid (integral to starter motor) was faulty, or if the ignition switch or wiring had a problem. Other possibilities include the battery state of charge, battery terminals, fuses and "earth" wire. On automatic cars there is additional control circuitry which may be faulty. I thought this was as an easy repair at first. I removed the intermittent left front indicator bulb, cleaned the electrical contacts and the fault went away, but only for a few hours of driving. It seems that this is a common fault not only with Polos. Posts on the web suggest that the bulb holder electrical contacts arrangement is a poor design, and can corrode for one thing. It may be necessary to remove and repair or replace the whole light unit. A repair that has been working for 3 months is to increase the size of the holder external contacts with solder. A small amount of solder, about 0.25mm thick, was added to both contacts. This photo shows one contact to the right of centre. This is not a permanent solution, but fault occurs less frequently. The plastic moulding which holds the stud for clamping the rear light cluster broke as I tried to unscrew the retaining nut. This may have been the first time removal was attempted in 15 years (since new). I found most of the broken off bits, and glued it back together with epoxy resin (2 part). After it had dried I glued pieces of wire mesh over the area to try to strengthen it (photo). Having fitted to the car, not tightly, it has lasted for over a year so far. I was advised that there was a leak after an MOT test, and it could be heard slightly. There are two catalytic convertors: one in the engine manifold and the second in the front section where the flexi section is located. So one must either replace the whole front section, or cut out and replace the flexi part (available from about £20). It didn't seem easily practical to fit a flexi-pipe repair section of the type that fits over the existing pipe. This is because the existing pipe bends near the back end of the flexi section, and there is a bracket close by. It may be possible to weld in a suitable repair flexi piece, but I opted for a new front section. These vary in price from about £100 to £400 plus; I went for a cheaper version. 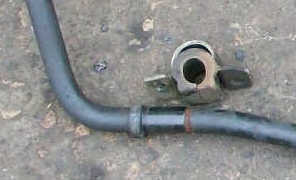 The post-cat Lambda sensor couldn't be removed in situ. To unplug the wiring the undertray was removed, then a protective cover, after which the plug and socket was accessible. As the rear discs were scored, it was necessary to change them along with their pads. It was not necessary to remove the caliper carriers (brackets) to change the discs, useful because the fixing bolts were seized. The pads were worn to different extents on each wheel - a result of recurring "sticking" caliper piston problems. 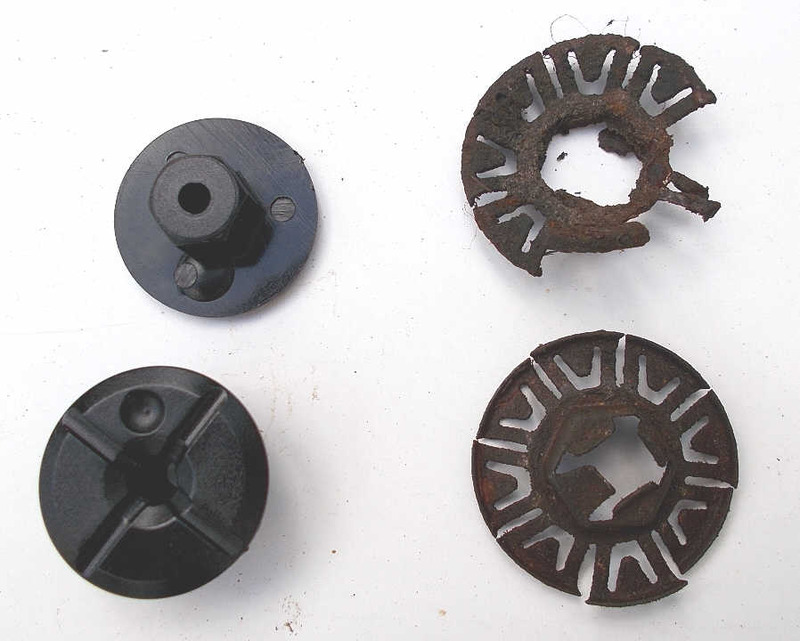 It seems that the problem was caused by corrosion inside the depressed rings of the caliper cylinder, which house the piston fluid seal and the dust seal (photo). 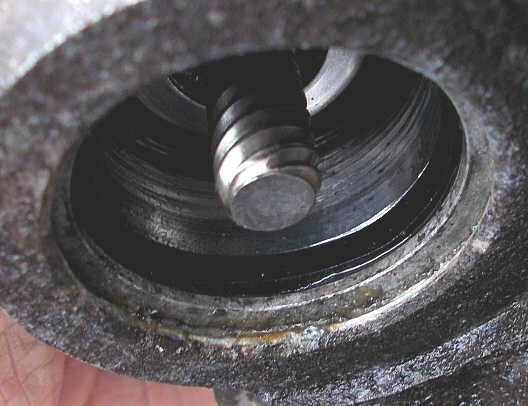 This corrosion would cause the seals to be pushed more firmly onto the piston inhibiting its movement. 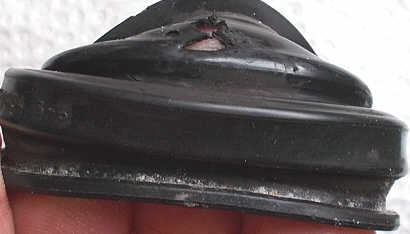 I suppose moisture in the brake fluid could cause this, and/or ingress of moisture due to a faulty dust seal (photo). Another possible cause is damage or corrosion of the caliper slider pins. Yet another issue is corrosion of the caliper carrier (bracket) in the area where the brake pads slide. On this model there are stainless steel shims, however rust under the shims will tend to expand and inhibit pad movement. I've omitted "routine" things like changing rear exhaust box (twice), and changing timing belts + water pump etc. at around 60,000 miles. Apart from the above problems, I'm reasonably happy with the 2002 model car. I'm told other makes are less durable, but I don't think Polo is quite so tough as was claimed in VW's advertising campaigns in the early-mid 2000s. On my car, the method shown in the owner's manual doesn't work. This method does work: with ignition off, press and hold the reset mileage button, switch ignition on. When warning lights go out release the reset button. Turn the reset button momentarily anti-clockwise, then momentarily clockwise. Apart from a true fault condition, this will of course illuminate if a wire to a wheel sensor is disconnected during maintenance. In the latter case the light should go out after the car has been driven normally over a few yards, otherwise a fault remains or the module could be faulty. It's worth checking and cleaning connectors before anything else. Although this contains a lot of useful information, I've noticed that in a number of instances the repair procedure is far more complicated than it needs to be, and wonder if that's a general thing. One example is changing a front strut/shock absorber - removing other suspension parts from the hub assembly is specified, but not necessary. Also, when changing the heater fan ballast resistor, removal of the heater (as specified) is not required. The methods in the book would at least double the time and effort required to do the repairs, an extremely bad thing! .... For another instance: when changing rear discs it says to remove the caliper mounting bracket. OK in theory but may be (very) difficult on older cars due to corroded bolts. My discs came off after removing the caliper and pads - much, much easier. On my model the front driver's side has a 21 inch blade. A Bosch AP21U Aerotwin type works well as a replacement (~£12), but a replacement Valeo blade did not wipe properly. The passenger side has a 19 inch blade, and a Valeo type does work OK here, as I expect a Bosch AP19U Aerotwin would. The rear screen blade has a "hook" fixing to arm, and a 13 inch replacement blade type Bosch SP13 (~£5) works well, others do not. Please don't email me with questions about other faults, maintenance, etc.. I'm not a mechanic, and my specialist knowledge of this car is included on this page. For anything else I have to look in the user manuals, search the internet or consult a garage. I don't guarantee that the information given is fully correct, or that you or your car may not be harmed if you try any of the procedures!